A former high-rolling poker player who went on one of the biggest heaters of all-time had avoided jail after admitting cheating at a California casino. 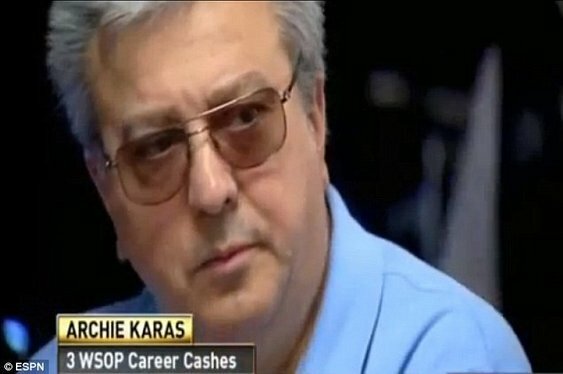 Archie Karas was given three years probation and ordered to pay $6,860 after admitting marking cards at a blackjack table at the Baronia Casino near San Diego. According to a report from Fox5Sandiego, presiding judge Daniel Goldstein told Karas that he would reducing the felony conviction to a misdemeanor if steered clear of trouble with the law for 12 months and had paid the outstanding restitution. The 64-year-old Karas found fame in the early 1990s, turning a tiny bankroll into many millions before gambling it all away. Click here for more on Karas' amazing spin up.